Major League Baseball’s All-Star Game came to Cincinnati on Tuesday, July 14, but that’s wasn’t the only thing we celebrated. 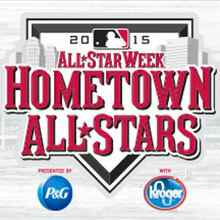 Kroger and Procter & Gamble gathered a group of nine dedicated local volunteers, naming them “Hometown All-Stars.” These are truly amazing people, and it was my honor and privilege to interview each of them for features in Cincinnati Enquirer. Sharing their stories was one of the most satisfying assignments I’ve ever had. The website created for the series is no longer online, but you can click the links below to see PDF versions of the individual stories. Posted in Blog, Sampler and tagged Advertorials, Local.